Cindy Needham: Last Craftsy Sale of the Year!!! Last Craftsy Sale of the Year!!! 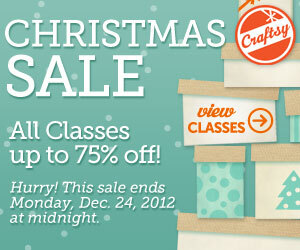 I just got word from Craftsy that they are launching one last big sale this year! I wanted to pass on the information to you in case you needed something else to stuff in your stocking. The sale will end on Christmas Eve day. Remember, there are lots of great teachers and classes to cover all interests so be sure to check them all out. Click HERE to be taken to Crafty's website.